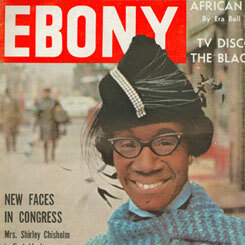 The importance of remembering the influence of Shirley Chisholm cannot be understated. As Professor Barbara Ransby of the University of Illinois Chicago said at the conference, “There is a way for people to disappear from our collective memory.” With Chisholm's campaign for Congress, role in the founding of the Congressional Black Caucus, and then her historic run for president, we must not let the lessons of her firsts simply become symbols of the past. We have a dangerous habit of turning those types of figures into symbols only instead of looking at their good qualities and flaws for what they really were. Her achievements as well as missteps should be held up to scrutiny thus they can become cautionary tales for those who come after. The celebration of Chisholm’s legacy was capped by discussion lead by MSNBC host and Tulane University professor Melissa Harris Perry, who analyzed Chisholm’s legacy in the context of images of Black women in the modern media landscape. How does a legacy like Chisholm’s match up to First Lady Michelle Obama or even rapper Nicki Minaj in how these images impact Black women’s perceptions of themselves? This was a long and dense discussion left somewhat unfinished. But that’s the beauty of Chisholm’s legacy; She started us all on a path and we have a responsibility to keep travelling–unbossed and unbought.